But with ample stores currently on board, the more pressing concern will be the status of the Progress freighter's launch vehicle - the Soyuz-U. Until the cause of Wednesday's failure is firmly established, it is unlikely the next astronaut flight to the ISS, due on 22 September, will be allowed to proceed. "The anomaly has only just occurred; there's quite a bit of work to do to sort through where we're at," said Mike Suffredini, the US space agency's (Nasa) ISS manager. "If things work out and it looks like the Soyuz will be able to fly then we'll let the crew on orbit stay until we do a normal rotation." It appears the Soyuz rocket's third and final propulsion stage shut down early. As a result, the Russian federal space agency (Roskosmos) said, the Progress vessel "was not placed in the correct orbit". The failure occurred some 320 seconds into the flight. Telemetry from both the rocket and the freighter were lost. It was the first big Progress anomaly in the history of the ISS programme. 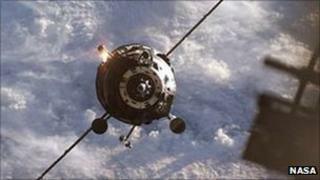 Officials reported the ship coming down in Russia's Altai province, some 1,500km northeast of the launch site. A loud explosion was heard in the region and there were reports of windows being blown out, but it is not thought there were any injuries on the ground as a result of wreckage coming out of the sky. The space station is currently manned by the Expedition 28 crew. This is commanded by Russian Andrey Borisenko. His flight engineers are Satoshi Furukawa (Japan), Mike Fossum (US), Ron Garan (US), Alexander Samokutyaev (Russia), and Sergei Volkov (Russia). They were informed of the situation by mission control in Moscow shortly after the failure. The astronauts have plenty of supplies on board. Last month's shuttle flight delivered sufficient food stores to maintain an ISS crew for a year. Further re-supply flights are planned by Japan and Europe using their robotic freighters early next year. Ordinarily, these would be preceded by two Progress missions. But if they cannot fly, the situation would still be manageable, said Mr Suffredini. "We're in a good position logistically to withstand this loss," he told reporters. "I can tell you we can go several months without re-supply if that becomes necessary." If Soyuz operations are suspended for a long period, however, it will become necessary at some point - probably in October - to start reducing the size of the crew on the ISS. There are a number of factors that might prompt the ISS partners to lower the complement. One would be the desire to slow the use of those consumables, such as toilet parts, that are depleted more rapidly and therefore need more regular replenishment. Another would be the safety restrictions that compel homecoming astronauts to use their return capsules by a specified date. One more would be medical protocols that restrict the time astronauts are allowed to stay on the station to limit their exposure to harmful doses of space radiation. This is the second Russian rocket failure in a week. On 18 August, a Proton vehicle put a telecommunications satellite in the wrong orbit. Another Proton failure in December resulted in top Russian space agency officials losing their jobs.